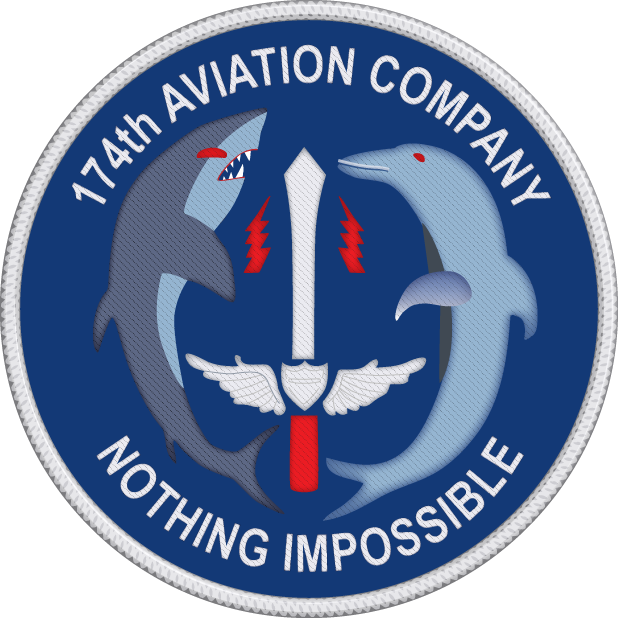 The 174th Dolphins, the "slicks," adopted the above nose-art logo in mid-1967 that became a standard for several years. 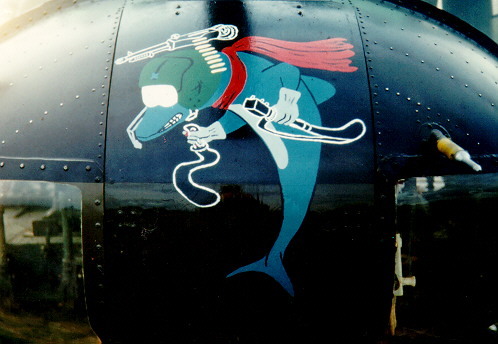 While there were a few individualized drawings used for nose-art on Dolphins, both before and after the ones depicted here, none were known to have been used on more than one aircraft at a time. The photo below was drawn on one of the Dolphin helicopters in early 1967, but was a one-only drawing (click HERE for more information on the photo below). As shown in the photo at the top of the page, the logo that did become widely used depicted a caricature of a dolphin standing on its tail. 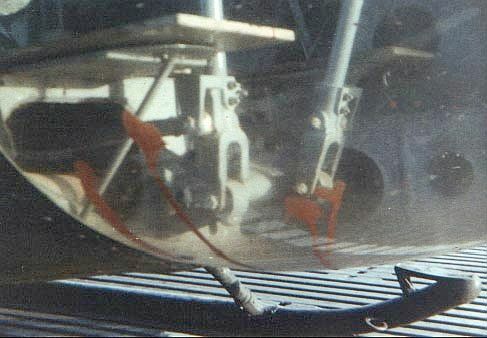 It was drawn on the nose of the helicopter on the avionics door cover, with teeth showing, wearing a flight helmet, with a red scarf around its neck. (Note: Later a red scarf was used to indicate Dolphins from the 2nd Flight Platoon and a yellow scarf was used to indicate 1st Flight Platoon.) An M-60 machine-gun was on top of the helmet. The dolphin had arms, and in its right gloved hand it was holding a cyclic. In the left hand it held a collective. Those were the normal flight controls held by the pilots while flying. 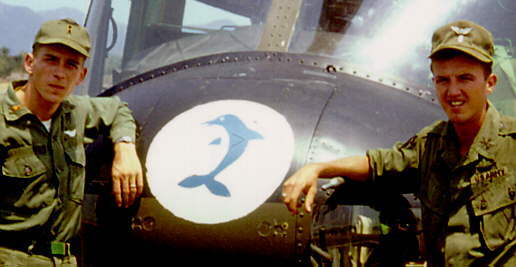 The below photo shows the original nose-art of this type, designed and painted on Dolphin 66-16235 by WO1 Richard Machina in July or August 1967. Dolphin 235 was a brand new UH-1D that had just arrived in the Company, and four of the first five photos on this page (with the exception of the early '67 photo) are of the same aircraft. WO1 Jim McDaniel (webmaster) and Machina were friends and platoon-mates in helicopter flight school at both Ft. Wolters, Texas and Ft. Rucker, Alabama. Machina only drew one of these logos before being severely wounded on 13 August 1967 and medevaced back to the States. He was shot up while flying in this very helicopter with McDaniel on a large battalion-sized combat assault supporting the 101st Airborne Division northwest of Chu Lai, in the vicinity of the Que Son valley. It was McDaniel's first flight as an aircraft commander and was to have been Machina's last flight as a "peter pilot" (co-pilot), before he too became an aircraft commander. Both McDaniel and Machina had passed their Aircraft Commander checkrides the day before this flight. 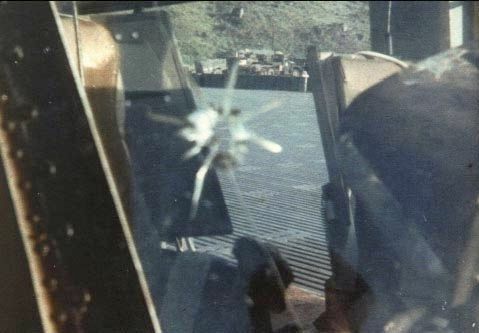 While at below 50 feet altitude on approach to an LZ "way out in the boonies," the helicopter took multiple hits in the fuselage and cockpit area from automatic weapons fire when it flew directly over the VC while on short final. Several armor-piercing rounds went completely through the aircraft body, including the fuel cells, exiting through the top of the aircraft. One round went through the windshield only inches from Machina. He was hit by another armor-piercing round that entered through the aircraft belly directly below his legs. The below two photos were taken of his aircraft soon after Machina was flown to the surgical hospital at Chu Lai. 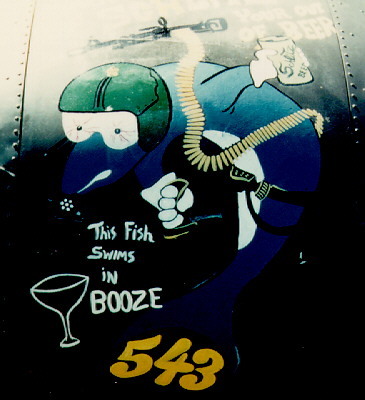 Machina's design was copied and many of the later Dolphin helicopters had variations of this same caricature painted on them by other people, usually crew chiefs and gunners. Others came to Duc-Pho with me, and Maj Brown talked some of us into extending. We were all very near the end of our tours at the time. 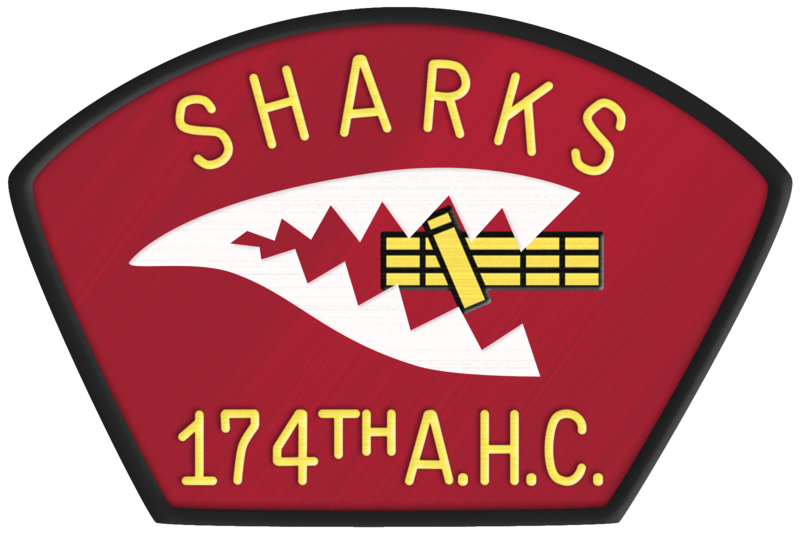 I extended, and as I had been in the 2nd Plt of the 176th, he assigned me to 1st Plt of the 174th. A few of the 174th helicopters did not have nose art, and I ended up with one of them. There was a guy who worked in the engine shop (tent) doing Hot End inspections. He had a few spare nose doors in there, and painted the Dolphin nose art on them, and in turn, sold them to the Crew Chiefs. He then got their old nose door when they replaced it with their new acquisition. Early in 1969, he must have DEROS'ed (returned Stateside), as the art studio just went away. I did a little bit of art for the guys, but the flight schedule got severe and there was little time to do anything but sleep. I recall doing intermediate inspections on the flight line every other night (that was a 25-hour inspection, every other night). Crew Chiefs and Gunners flew on medical waivers all the time. The paperwork was handled routinely between the Flight Surgeon and Operations so we didn't even have to go in for the medical after our first time. With the resident artist from 1968 apparently now DEROS'ed, and no one else in the Maintenance Plt. doing the work, attrition just caused the nose art to fade away. Some of us painted names on the nose (that was something anyway), but there was little enough time for that. I painted "Satan" on 463 (my helicopter), and we had to take off with the paint still wet. I was concerned it would get smeared across the nose, but the paint held. 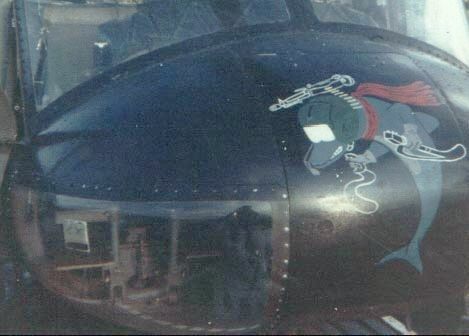 About the time the Dolphin nose art began to vanish, the Sharks found an artist somewhere, who had the time and materials to paint the large art displays on the compartment doors just ahead of the tail boom. Perhaps each Shark Crew Chief did his own art work, I don't know. As far as I know, no authority issued any orders against the nose art. They did, however, put a stop to the painting of flight helmets in very late 1969. Those of us in the first platoon were ordered to paint our helmet black, or olive drab, but no other color, or art allowed. This was near the end of my tour then, as I had extended a second time while at Duc-Pho (finally going home after two years and six days, in January 1970). I don't know about anything that happened before or after my tour with the 174th, but what I have written here, is just how I remember it. Thanks for your time, and I hope this helps answer your question. --Ben Kennedy, Dolphin Crew Chief Nov 1968 to Jan 1970.